Should the Neighborhoods back the Main Gate project? Click here to read: Neighborhood association ought to back Main Gate project, by Robert Lanning, Architect. Published by the Daily Star. Here are some other points to consider: An edge / transition strategy is necessary. It is missing. One way it can happen is with a sub-regional downtown / U of A master plan that outlines what is coming so neighborhoods know what kind of final input they need to be prepared to engage in. The MGD skirts this. It is a fast track style re-zoning which is developer driven. If the project is like the $35 million dollar“Vue on Apache” in Tempe, Neighborhoods might have reservations. Not only is neighborhood input necessary in driving our best urban planning but to imply neighborhoods can not be part of a plan omits a key part of the picture. Watching the frustration of developers and neighborhoods year after year speaks for itself. 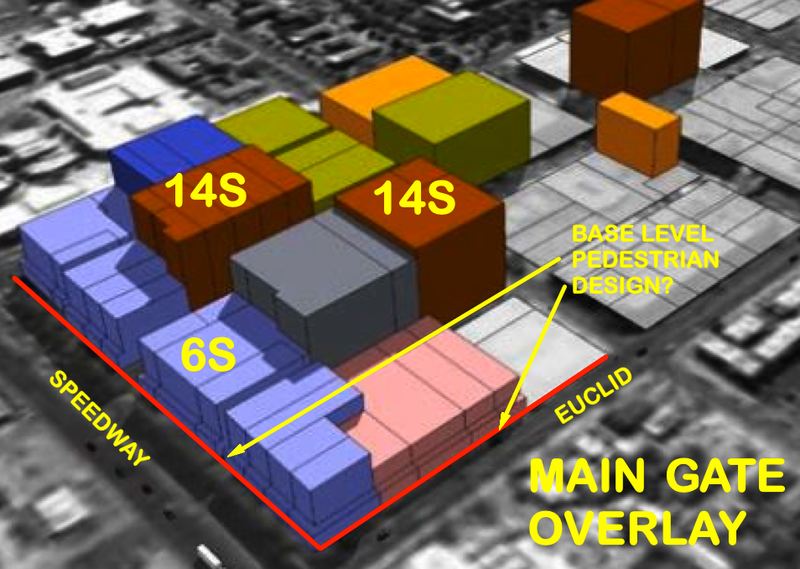 Many agree that the transition is or should be the stretch of property just east of Euclid, but what does it look like? Are there plazas, hard-scape, sidewalks, trees and base development of low masses, including some of the fine historic structures creating the idea of being walkable and pedestrian friendly. A good transition insures this and when you look at historical structures that might be part of this, you have to see beyond the weeds. Map courtesty of WUNA.